Hi everyone and welcome back to Tip Tuesday! Today’s tip isn’t exactly homeschooling related, it’s more homemaking related. Have you ever wondered how we keep on top of laundry with a large family? 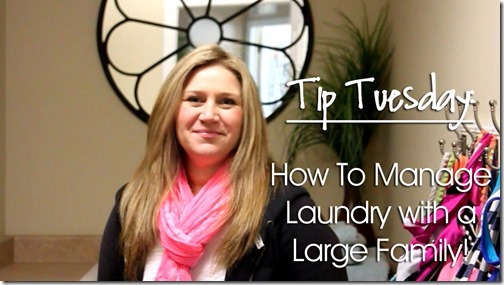 Well, this week’s Tip Tuesday is all about how we organize and handle our laundry! With a family of six, laundry can get a little bit overwhelming! But today I’m going to show you how to say goodbye to piles of dirty and clean laundry cluttering your house. Here are a few of my tips to keep your laundry from piling up, so let’s get it washed, folded, and put away! 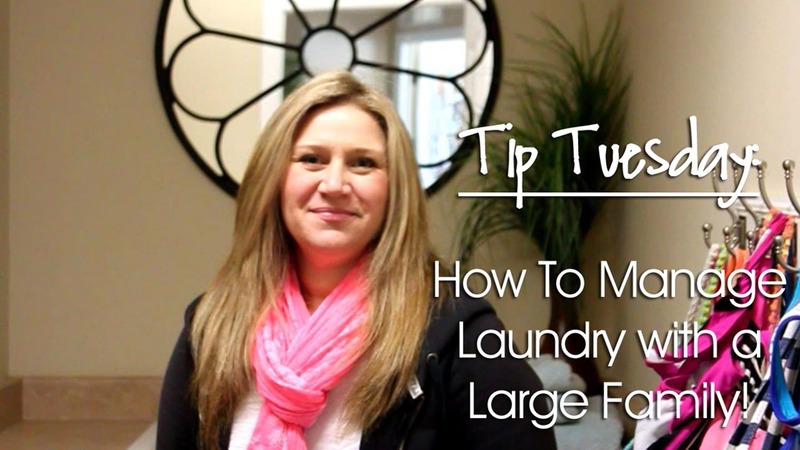 Check out my Large Family Laundry Tips video below! Do one load each day. I combine colors and whites if they aren’t too different in tone. If I have a lot of blacks/whites then I will separate them into two loads. Since our laundry is upstairs, I start a load in the evenings after everyone has put dirty clothes in the laundry room. But if your room is downstairs, start a load in the morning, then swap it to the dryer when done. Share the job! We rotate out the job of washing, drying, and folding laundry. My older kids prefer to fold on their own, but I usually have Miss Lady Bug fold with an older child. She doesn’t do a great job folding, but if it’s only sitting in their basket for a little bit then it really doesn’t matter. Plus, I’m not sure about your kids, but mine tend to shove it in their drawers without folding anyway. Give each person their own laundry basket/bin and have the designated folder place clean items in each bin. That makes it easier for them to get their clothes to their room, and keeps them separated as well. Put your laundry away each evening before bed. Each evening have everyone grab their bin and put it away. I find for kiddos, it’s a lot easier to put away 1-2 outfits each night, than to have a whole pile to put away at one time! Keep it accessible! If possible, make sure your child can reach the clothes in their closet. We have lower hanger bars for their shirts, and then they also have drawer units in their closet to store folded items. Our new house had built-in lower bars for the kids, but in our old house I just purchased a cheap hanger bar that hangs down from the normal height bar so they could reach their clothing. I hope you enjoyed today’s Tip Tuesday, and if you have any storage tips to share, make sure to leave a comment below! Thanks for sharing. We are also a family of 6 and we do almost the same as you. The only difference is that we designate a day per person. Example, Monday is devoted to child #1’s laundry, Tuesday for daddy, etc. So, each person only does their laundry once per week, which tends to work fine. We each have our own basket. This helps to know whose laundry is in the dryer and it saves time because we don’t have to seperate out whose laundry is whose when folding. Yeah, we’ve tried that but since we swim, have hockey, and ice skating a couple times a week, we have to get all of that stuff washed regularly so for now we wash everyone’s daily. But I do like the thought of not separating it out from the dryer! We also do one load a day to stay on top of it all. Occasionally we have two loads depending what we had going on the day before. Our routine is a bit different, though. My sons carry the laundry basket from the bathroom to the laundry room and sort/turn things right side out. I put the clothes in the washer, and then I switch it to the dryer as soon as it is done. About 2 years ago my daughter asked for a paid chore to earn some money each week since all of her other chores are not paid chores. I loathe folding laundry and putting it away so that’s the job I gave her. Once a day she folds the load and puts it all away. She gets paid at the end of each week. It has been the best thing ever because our laundry never gets backed up, she’s earning money and holding a job, and it’s less on me to do. I wish I had your laundry room! We’re still renting and lugging laundry up and down steps and storing detergent wherever we can. We are only a family of four, but I have a 2 and a half year old and a 1 year old, and I think they make more laundry than anyone else. Great video. I’m going to try to figure out a way to streamline on laundry like you did… well, once I catch up! Preschoolers go through more clothes in one day than a runway model! Erica, I’m loving tip Tuesdays. Thanks! Right!?! LOL! Glad you like them! Loving these tip Tuesdays! We use those bins in our laundry room to store shoes, but I may try to figure out how to use them for laundry, as well! Great ideas! Definitely helps keep the home happy and running smoothly! We also pin our socks so there are never lost socks or Mis-matched socks!! Plus it saves on folding time digging through mountains of different sizes and Color socks. We are also a family of 6 and I always find ourselves buried in laundry… actually, not buried, just surrounded by laundry! I try my best to at least keep the mess upstairs, but I’ve even resorted to having one laundry basket (a pretty, wicker one) downstairs just to keep the clothes contained. After washing, they all end up in a piles. That’s really all I have energy for – to at least separate them in piles for each person. I would like to try this idea of yours – having bins for each person AND, most importantly I think, having each person take a bin to put away clothes before bed, every night! Great video! We have same wire basket but bought ours from either Lowe’s or Home Depot! Thanks for doing this!! !